Do you remember the famous "Nannare nannare" song from Guru where Aishwarya Rai dances in the background of the waterfalls and the waterfall in Bahubali. 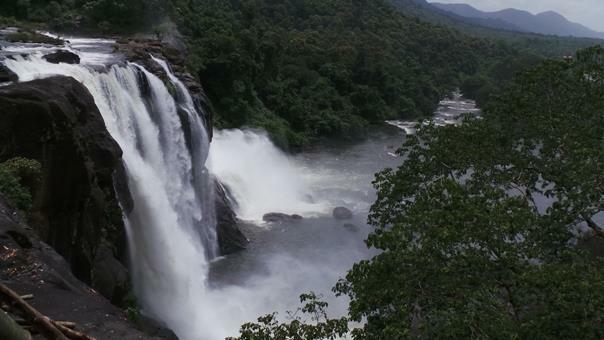 It is none other than the Athirapally falls which is one of the famous filming locations in Kerala. The falls takes a plunge of about 80ft down the cliff before it merges. Before the fall, it splits into 4 undergoing the drop. 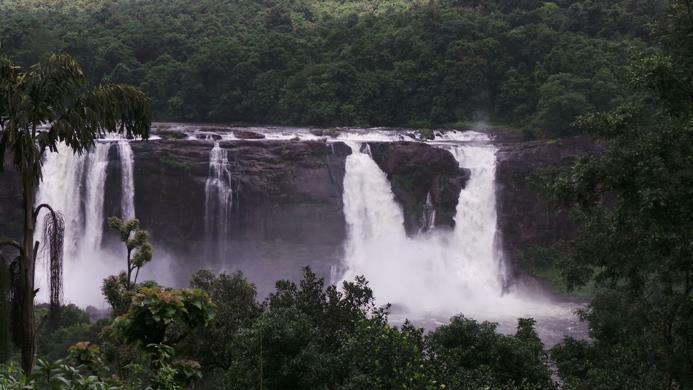 It is one of the highest waterfalls of Kerala which is referred as Niagara of Kerala where the force water is very high especially if the monsoon is at its peak. The falls has 2 view points - one from the upper location where the falls take the plunge and other at the lower point where the falls land after the plunge. If the monsoon is at its peak, going to the bottom of the plunge may be prohibited depending on the water force. Going to the falls landing point involves a not a very steep descend down the 80 feet with curving paths leading the way making it an easy trek. In rainy seasons, the descent is slightly slippery and taking senior citizens is not advisable. The waterfalls is located about 85 km from the scenic town of Valpaarai in Tamilnadu . The ride involves a long ride through the Kerala Forest (about 40kms) and night riding is not allowed. 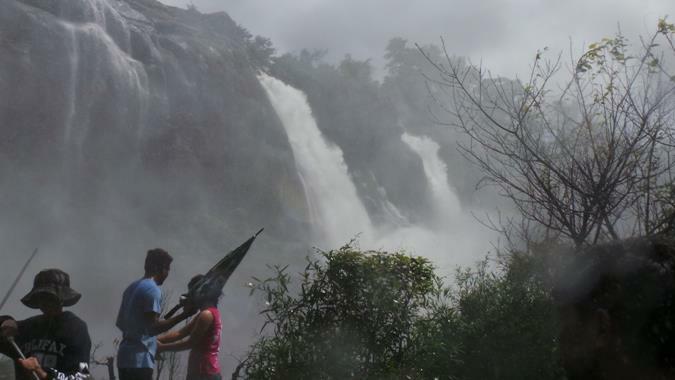 Sarpa falls and Vazhachal fall on the Valparai Athirapally route and route is generally devoid of traffic making it an enjoyable but cautious ride. Regular buses are available to Athirapally from the town of Chalakudy. KSRTC as well as private services connect to Athirapally from Chalakudy and some scheduled services available from Thrissur also. 3. Best time to visit if post monsoons (August onwards)- Carry an umbrella/rain jackets while going to the base of the falls as the showers can leave you drenched. Its strictly prohibited to enter the water.